Seasonal Occurrence: Abundant in all seasons. Nests in our area. Profile by Bryce Loschen: Great Blue Herons are the largest of the North American herons, standing tall over wetlands and shores of open water. 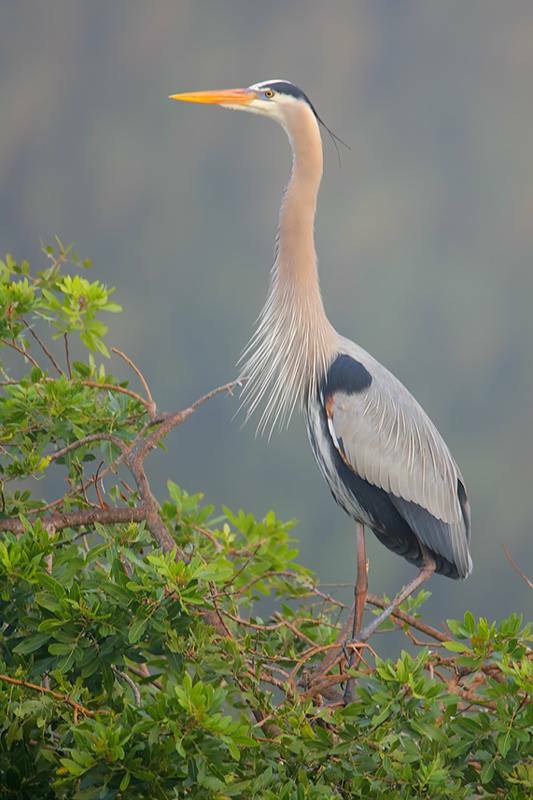 Great Blue Herons are blue-gray overall with a wide black stripe over their eye and a long yellow-orangish bill. In flight their wings are two-toned with blueish forewings and black flight feathers, and their neck is usually coiled in, unlike the similarly sized Sandhill Cranes. 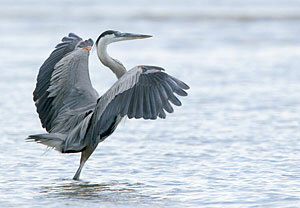 Great Blue Herons are highly adaptable and can be found in marshes, swamps, shores, and tideflats. Some will even forage in grasslands and agricultural fields. They have a general diet consisting of fish, frogs, salamanders, turtles, snakes, insects, rodents, and even other birds. 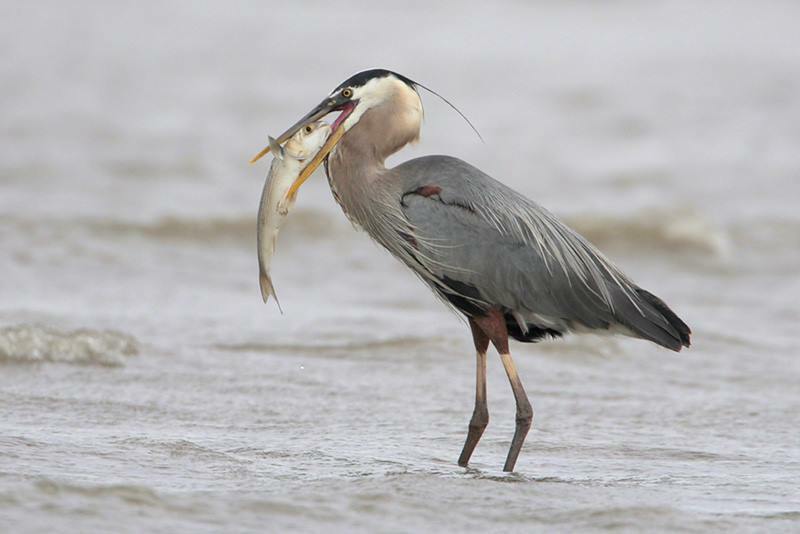 Great Blue Herons will stand or walk slowly through shallow water before quickly striking with their long bill, grabbing small prey or impaling large fish. Great Blue Herons nest in colonies, and usually build nests high in the trees, but will occasionally nest on the ground or in low shrubs. Great Blue Herons can be found throughout most of North America, as far north as Alaska and southern Canada in the summer. Northern populations east of the Rocky Mountains are migratory and winter in the southern United States, Central America, or South America. Their diet and general hardiness allows Great Blue Herons to spend the winters farther north than most herons. 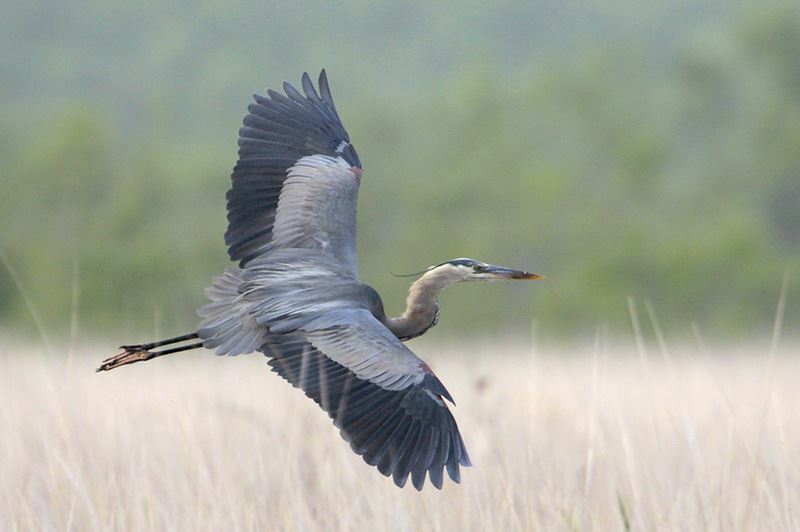 Great Blue Herons are well adapted to many habitats, and are therefore still common and widespread with stable populations. Many can be found throughout Texas year round including at Houston Audubon’s Bolivar Flats Shorebird Sanctuary!